Great location just a short walk from the Luton Airport Parkway train station and just off junction 10 of the M1. The airport is 1.5 miles away and Luton town centre is 2 miles away. 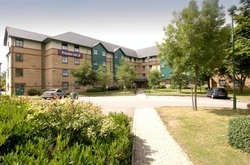 This Premier Inn has free parking and an on-site Beefeater restaurant serving fresh quality meals throughout the day. Book direct for the best Premier Inn Luton Airport deals.